Harlequin Buccament Bay flood deaths caused by neglect, dereliction of duty? “Seeing as the government knew about the need to carry out river flood protection, why did they give Harlequin’s Buccament Bay Resort permission to build in a known flood plain on a river that required river bank flood defences installed? Why did they approve of building private houses in a flood plain, next to a dangerous river requiring bank and river base restructuring and defences? Why? Why? Can they tell us Why? Whilst researching the Christmas Buccament floods I discovered that both Ralph Gonsalves and Julian Francis as government ministers were both informed as early as 2001 that Buccament was likely to flood. They were instructed to carry out urgent river defenses but almost every year for about 13 years just got more and more reports on the matter. They had the reports done because the World Bank was paying for the reports, they cost us nothing. But after getting the reports they failed to act – and that failure to act proved to be fatal for a number of people. In some of the reports it is even quoted that Buccament is in a flood plain. As such they allowed new building in a flood plain next to a river that was almost certainly going to flood, and it did. Remember the videos of Gonsalves walking through Buccament with tears in his eyes? Was that all an act? He must of been terrified that the people would find out that he was pre-warned and failed to act, thus being a direct contributor to the loss of all those poor people. The piece below is something I have submitted to all the newspapers and online publications. We will have see if the SVG newspapers have the courage to publish what I have written, regardless of the fact that its all verifiable as the truth. 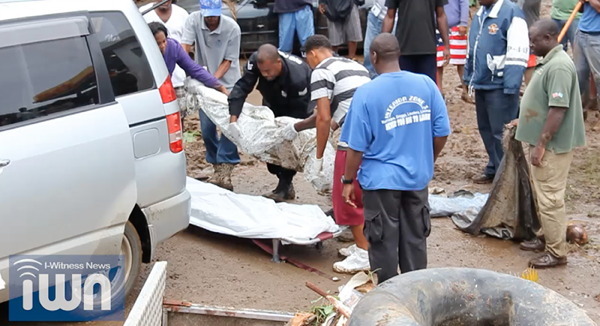 Buccament Bay flood deaths neglect, dereliction of duty or something worse? On December 24 and 25, 2013, Saint Vincent & the Grenadines was hit by a low-level, high-impact trough system which caused severe infrastructure damage to the country. The trough brought high winds, torrential rains and floods. Local rainfall stations reported between 200mm and 310mm on the windward side of the island and 153.3mm in the leeward side of the island. As a result of the disaster event, there were 11 confirmed deaths and 3 persons were never found. The final disaster assessment concluded: 77 homes were completely destroyed or severely damaged; approximately another 300 homes were damaged; and 500 people were displaced and housed in temporary shelters. Since their first year in power there is unequivocal evidence that the Unity Labour Party [ULP] government have been fully aware of the vulnerability to serious flooding at Buccament and in other places. They were aware that Buccament is generally a flood plain area. Their studies from 2001 to 2014 show just that. They have had thirteen years to put river defenses in at Buccament, but failed to do so. The Christmas 2013 Buccament flood tragedy occurred and lives were lost. For thirteen years the government had dragged their feet and carried out numerous studies for Social Assessment Disaster Vulnerability Reduction Projects, at Buccament and elsewhere.